I’m pretty humble when it comes to my recipes, but I’ve gotta’ say, this EASY Sheet Pan Trader Joe’s Cauliflower Gnocchi recipe is pure genius. Skeptical? Don’t be! 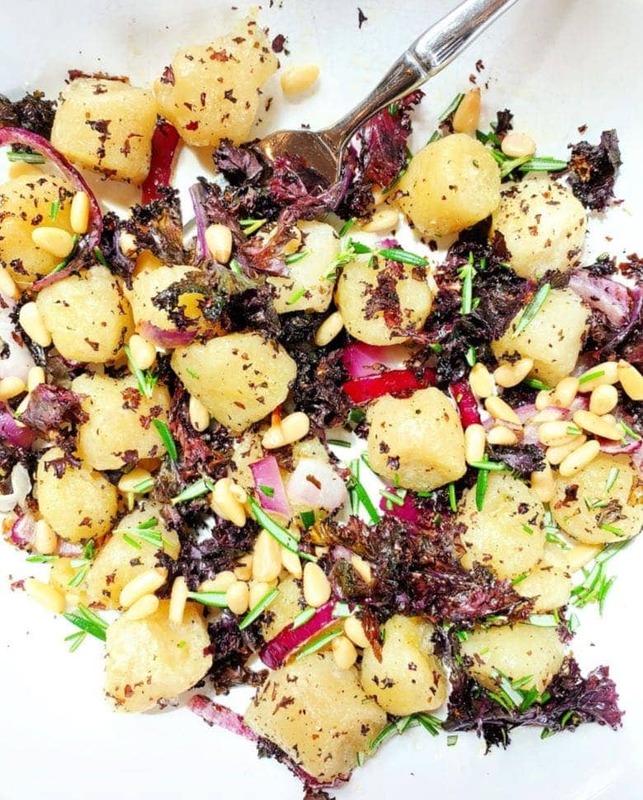 This Trader Joe’s Cauliflower Gnocchi pairs deliciously with crispy kale, roasted red onions, pine nuts, and fresh rosemary. If you haven’t discovered Trader Joe’s Cauliflower Gnocchi yet, I’m sorry. Very sorry. Get yourself to TJ’s and buy some ASAP (you should probably stock your freezer with several bags). Then come back to make this recipe. I’ll wait. OK. Now that we’re all ready, let me tell you a little bit more about this EASY, DELICIOUS recipe I stumbled upon serendipitously today. You see, SiSi and I are heading out of town on a red eye tonight to go do some final college tours. And, knowing that Mr. Spicy and Big Tex will be home alone for the next week, I needed to clean out the fridge. Because I’m pretty sure they won’t be feasting on kale while I’m gone. Bahahahaha!!! In my clean out mode, I discovered a cut up red onion, purple curly kale, and half a package of Trader Joe’s Cauliflower Gnocchi. I knew it was time to experiment. 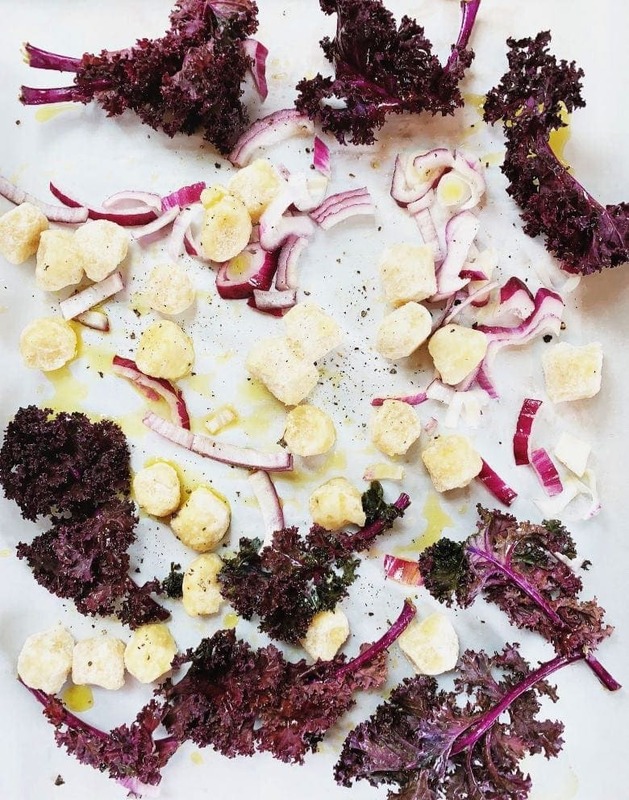 Spread Cauliflower Gnocchi (frozen) on the parchment paper, along with torn up kale (de-stemmed), and sliced red (or sweet) onions. Drizzle with olive oil, and sprinkle with salt and pepper. Roast in oven for ~15 minutes, then removed kale into a serving bowl. Continue to roast cauliflower gnocchi and onions for an additional 5-10 minutes. Add gnocchi and onions to serving bowl and toss with kale. Drizzle addition olive oil on top, if desired, and top with pine nuts and chopped fresh rosemary. Lunch (or dinner) is served! Trader Joe’s Cauliflower Gnocchi, purple curly kale, and red onions all ready to be roasted on a sheet pan. 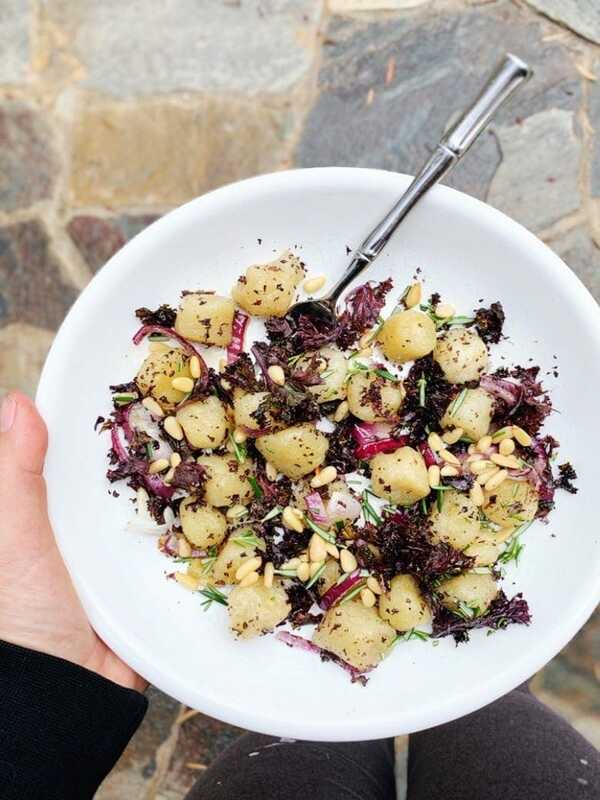 If you’ve done an internet or Instagram search for “how to cook cauliflower gnocchi”, you’ve probably noticed that some people are pretty passionate about how they prepare their Cauliflower Gnocchi. The sheet pan method I used (not listed on the package) gets pretty high ratings, but you can also pan fry it or microwave it. I’ve tried the pan fried version, and it’s pretty good, especially if you get it nice and crispy, but it can also be a little sticky and gummy. I haven’t tried microwaving it yet, especially because it cooks up so quickly in the pan, or oven. If you’ve tried it this way, let me know how it turned out. I’m a new fan of the sheet pan method, because you can easily cook it with other foods/veggies, and it makes clean up a cinch. With olive oil, garlic, salt & pepper. Roast it on a sheet pan w/ cherry or grape tomatoes & garlic, then top it off with arugula, fresh basil, and kalamata olives. How would YOU eat your cauliflower gnocchi??? Is Trader Joe’s Cauliflower Gnocchi Healthy? How Many Carbs Does It Contain? 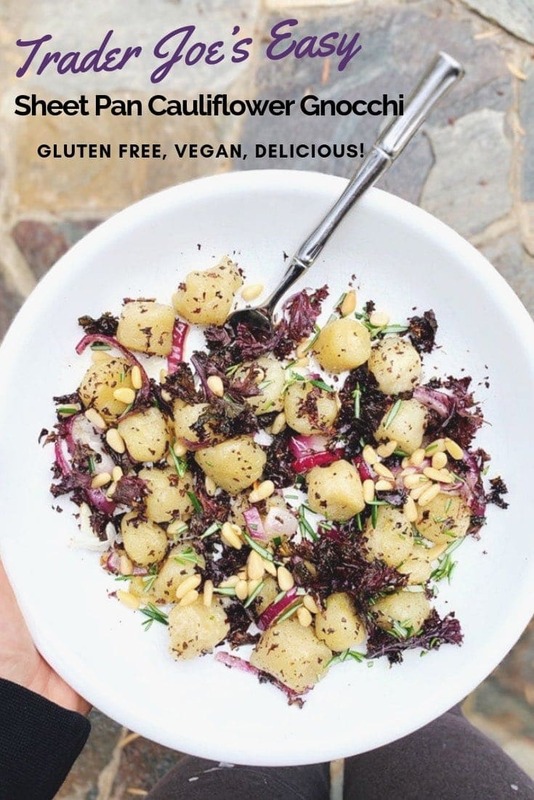 While I have no qualms about eating traditionally made gnocchi (a gluten free version like this one from Gluten Free Jules), I suspect Trader Joe’s Cauliflower Gnocchi is such a cult hit, because of the lower carb aspect. While it’s not exactly low carb, it definitely has fewer carbs than traditional gnocchi. 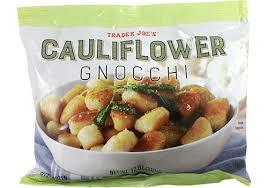 1 cup of TJ’s Cauliflower Gnocchi has 22 grams of carbohydrates, and 6 grams of fiber. Compare this to traditional gluten free gnocchi which has 47 grams of carbohydrates and 3 grams of fiber. I definitely like the higher fiber aspect of the cauliflower gnocchi! And, when you add additional veggies, nuts, fresh herbs, etc, to your Trader Joe’s Cauliflower Gnocchi, I can 100% wholeheartedly endorse this as a healthy meal. You’ll love this EASY sheet pan meal featuring Trader Joe’s Cauliflower Gnocchi, Crispy Kale, Roasted Onions, Fresh Rosemary, and Pine Nuts. Serve it for a healthy lunch or dinner. SO good! Preheat oven to 400 degrees F. Line a large sheet pan with parchment paper or aluminum foil. Spread cauliflower gnocchi (frozen), sliced onion, and kale on parchment paper. Drizzle with olive oil and season with salt and pepper to taste. Roast in oven for 15 minutes. Carefully remove kale from sheet pan, and place in a serving bowl. 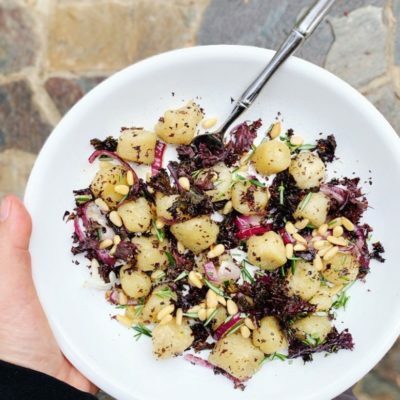 Add gnocchi and onion to bowl with crispy kale and toss to combine. Drizzle on additional olive oil, if desired, and top with pine nuts and fresh rosemary. Divide into 2 servings and enjoy while hot. *For crispier gnocchi: Note: Move sheet pan to top of oven and cook for 10 minutes (or longer) depending on how crispy you want your gnocchi. Have you eaten Trader Joe’s Cauliflower Gnocchi before? What’s an easy recipe you created on a whim, that turned out to be delicious? Anything you would add to this recipe??? P.S. Craving more cauliflower recipes? I think you’ll love these! Loved this article. I learned a lot in this and i definitely agree with this combination of freshness. You should post more about this on your blog. I have used many methods to help me on my diet journey, but the most effective method was the Keto resources program. I was able to see the results in less than 1 week. You can check it out here https://bit.ly/2ICixAf. Cheers again for the great content.